What is NTSC Format DVD? How Can I Play NTSC DVD in the UK without Restriction? 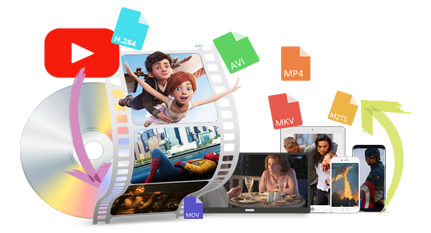 NTSC DVD means the encoded MPEG-2 movie video on a DVD is stored in digital format and is formatted for NTSC TV standard, which adopts a frame rate of 30 fps using 525 lines and 720x480 resolution with either a 4:3 or 16:9 aspect ratios. NTSC format is mainly supported in USA, Canada, Mexico, Japan, South Korea, etc. WonderFox DVD Ripper Pro is a versatile DVD ripping tool that grabs all your NTSC DVDs without stress so that eliminating the limitation of the NTSC DVD region. Then you can enjoy NTSC DVD movies in any country. Download it to have a try! Someone may ask "Can I play NTSC DVD in UK?" Not necessarily! Most DVD players and TVs sold in PAL countries can play two formats, but don't forget the area code restrictions. For example, a standard UK DVD player (PAL Region 2 only) can play Japanese NTSC DVDs that are also Region 2, but cannot play Region 1 US NTSC DVDs. Therefore, if you want to play DVDs of any country without barriers, you need to purchase a Region Free DVD Player and have a PAL compatible TV set or Multi-System PAL/NTSC Digital Video Converter. How Can I Play NTSC Format DVD without NTSC DVD Region Limit? So, if I want to play DVD movie without the restriction of DVD NTSC standard, what should I do? The best solution is to convert the NTSC DVD disc to a digital video format so that you don't have to worry about DVD damage, DVD region code, PAL/NTSC system limitations, besides, you can back up archived DVDs, and transfer them to portable devices for free playback like converting DVD to iPhone X. It sounds complicated, but in fact, only a few mouse clicks can finish the conversion with the right DVD converter. 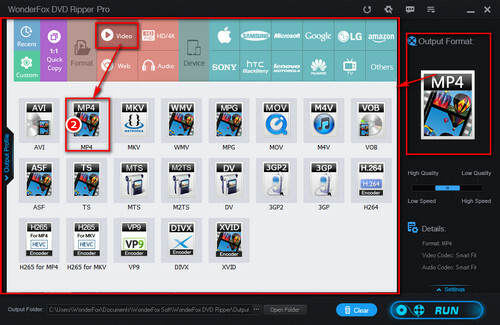 WonderFox DVD Ripper Pro is the first-class DVD ripper that allows you to convert NTSC format DVD to digital video formats including MP4, AVI, MKV, MOV and more, besides, you can also directly copy DVD to PC, tablet, TV, mobile phones, etc. Now, free downloadfree download this DVD video NTSC ripper to start! WonderFox doesn't advocate illegally ripping DVD content. Please make sure your behavior is legal in your country before converting NTSC DVD to digital video. Preparation: Load NTSC DVD into DVD-ROM and free downloadfree download WonderFox DVD Ripper Pro on your PC. Launch the program you just installed, and click on “DVD Disc” to load DVD content. The software will automatically analyze, identify, and decrypt DVD as well as check the main title for you. 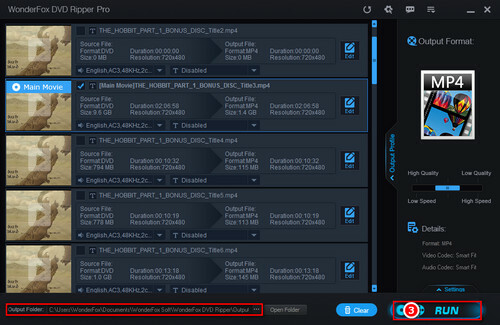 Tips: As you can see, you are also allowed to rip ISO file and DVD folder. Head to “Output Format” to choose one desired format or device. For an example, click on “Output Format” section on the right side to access the new window. Click “MP4” icon under “Video” tab to convert NTSC DVD to MP4. Finally, set the output path on the bottom and click on “Run” button to finish the whole conversion process. After that, you can find the final NTSC DVD movie in the output folder then you can play NTSC format DVD everywhere without hassle. 1. Extract audio from DVDs, such as ripping DVD to MP3 for playback on portable devices including iPhone, iPad, Android devices, etc. 2. It can decrypt almost all kinds of DVDs you own and convert DVD to devices like DVD to Roku, DVD to tablet, etc. 3. With the software, it is possible to extract subtitle from a DVD and save it in an SRT file. As a professional DVD video converter, this software can effortlessly convert NTSC DVDs to digital video formats. In addition, you can convert any local file to another video & audio format, of course, it can be true if you want to convert files to a specific device. Download this software to experience its powerful features. The Best DVDs to Tablets Converter - Copy DVD to Android Tablet in Minutes DVDFab Crack Full Version Free Download and Instruction How to Play PAL Format DVD without Any Restriction?